Make Your Next Move Stress Free! Whether you&apos;re moving from your first apartment into a new home or downsizing as an empty nester, a move can be an incredibly stressful life event. Between packing everything into boxes, plotting how it will fit in your new space and trying to determine what you can get rid of, moving means a series of difficult decisions during what is undoubtedly a short timeline. Stop the madness with these quick tips that will take the pain out of moving. Stress feeds on distress, so staying positive is one of the best ways to stop stress before it can grab you. Even if moving wasn&apos;t your first choice of activities for the year, make the best of it -- maybe this is a chance to meet new people, open up new possibilities for your future and make something good of a challenging situation. 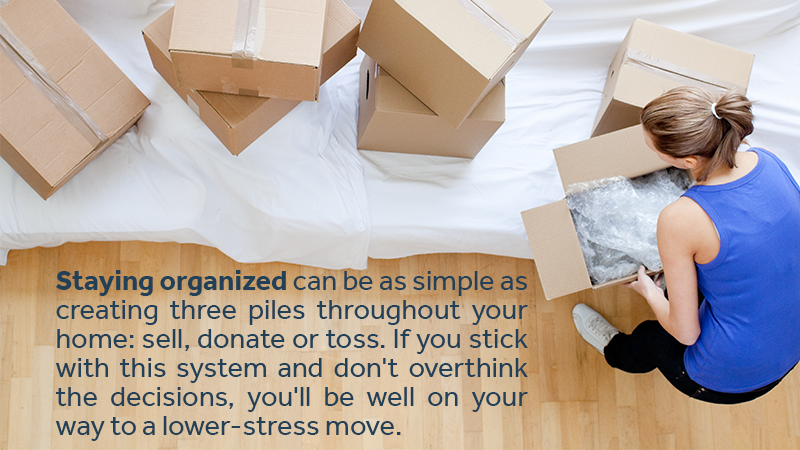 Staying organized can be as simple as creating three piles throughout your home: sell, donate or toss. If you stick with this system and don&apos;t overthink the decisions, you&apos;ll be well on your way to a lower-stress move. The most difficult part of this tactic is being honest with yourself on what will truly sell and keeping that stack small enough to be manageable. If you aren&apos;t able to immediately sell something, you then have to decide if you want to move it to the donate or toss piles. Be realistic! Even as you&apos;re planning moving parties with your current friends, it&apos;s never too soon to start scoping the new space for people who might share your interests. Moving can be scary, so don&apos;t be afraid to lean on your support network (emotionally or for physical help during the move). Even though you may not see an immediate need for an item, there are often things that you need to store for a period of time before they are useful to you again. Perhaps you&apos;re taking a year-long assignment that requires you to move into a furnished smaller home or apartment. Do you want to pitch all your belongings and start again? Of course not! However, storing the items that you don&apos;t have immediate space for can be challenging. Storage solutions can take the hassle out of packing, moving and storing your belongings and is very affordable. When you&apos;re ready to make your move, give Zippy Shell Houston a call. We can take all of the hassles out of the moving and storage process! Your items are always safe in our street legal mobile pods because you are the only one with a key to your particular pod. Fill out our online form today for a free estimate - we even offer military discounts for those frequently in need of moving services!